In markets around the country, the most in-demand building type isn’t an office, K-12 school, or hospital. It’s a multigenerational recreation center. Rec centers have been popping up everywhere, most conspicuously in Midwest and Western states, but usually after prolonged debates about funding and function. Once those factors are settled, the size and scope of rec centers almost invariably expand beyond the project’s initial design plans to meet stakeholders’ expectations. Over the past 15 years, rec centers have evolved from an aggregation of gyms, sports courts, and small pools into “hubs of the community” and “transition zones” where people of all ages meet, exercise, relax, and learn, according to Zach Bisek, AIA, LEED AP, Senior Associate and Quality Assurance Leader for Barker Rinker Seacat Architecture (BRS), a Denver-based firm that specializes in rec center design, which accounts for more than 70% of its work annually. 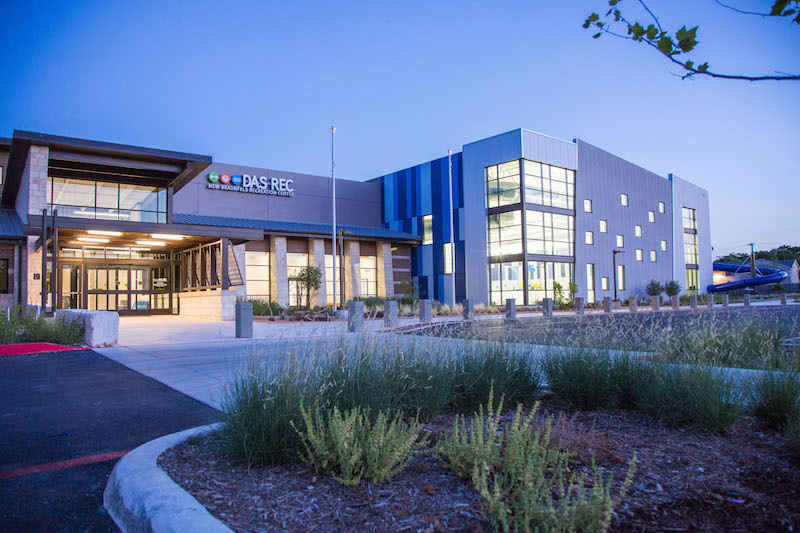 One of BRS’s recent projects, which it designed in collaboration with Dekker/Perich/Sabatini, is the Center for Recreational Excellence (CORE), a $63.5 million, 158,000-sf facility that opened in Hobbs, N.M., last June. 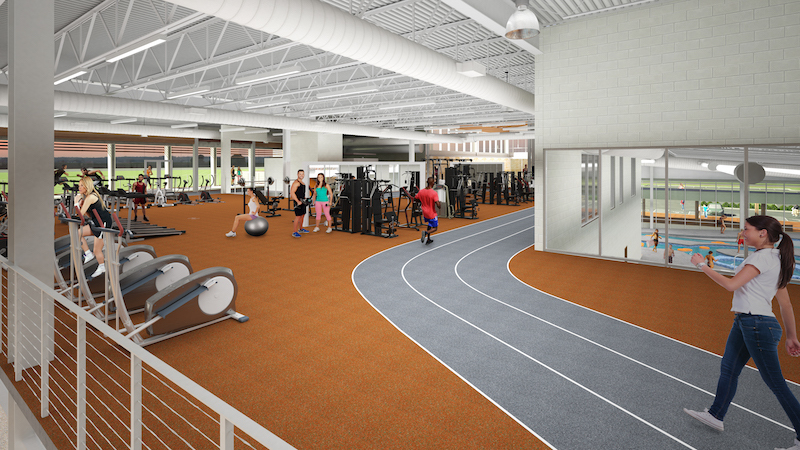 CORE consists of three large boxes for a turf field, MAC gym, and Aquatic Center, organized around a center atrium space, which encompasses a children’s playground, ramping jog track circuit and fitness area. CORE is the largest public-private collaboration in that state’s history, according to JF Maddox Foundation, a funding partner with the city of Hobbs, Lea County, the state, New Mexico Junior College, Hobbs Municipal Schools, and the University of the Southwest. The city views CORE as a potential catalyst that will attract New Mexicans from as far as three hours away, and will spark further development of retail, restaurants, and entertainment. Despite being hemmed in by 100 miles of desert on all sides, Hobbs is the 7th-fastest-growing community in the U.S, according to Forbes magazine. It’s sitting on huge petroleum reserves, and the country’s only uranium enrichment plant is in nearby Eunice, N.M.
JF Maddox, a private endowed foundation committed to improving the quality of life in Hobbs and surrounding towns, chipped in $27.5 million for CORE. Bob Reid, its CEO, says that CORE—which replaces three existing, albeit antiquated rec centers—is one of the “assets” the city has been developing and building over the past two decades to attract and keep people there. CORE is within a 1,000-plus-acre area that the city is rebranding as Synergy Park. That area encompasses a 10-acre lake, walking and biking trails, a horsetrack and casino, an event center that shares a parking lot with CORE, the Western Heritage Museum, the Lea County Center of the Arts, an indoor equestrian facility, and a golf course. “We know there are lots of companies scouting this market” for expansion, says Reid. 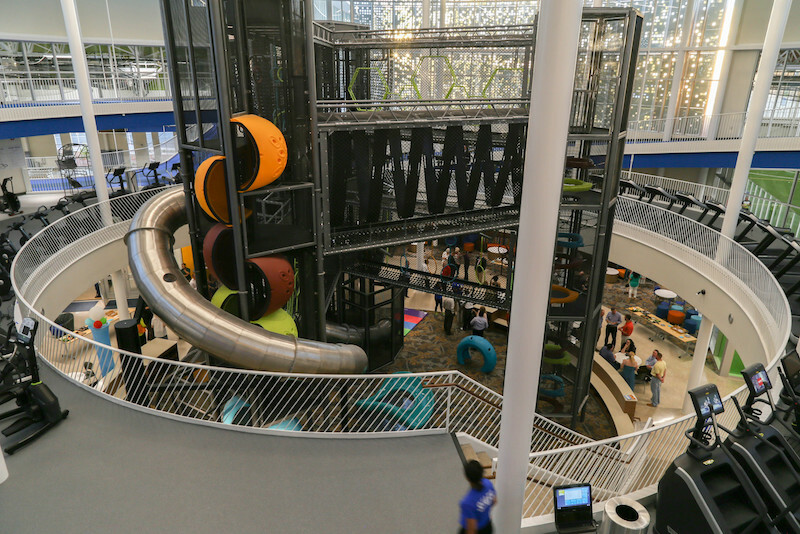 The Center for Recreational Excellence (CORE), which opened in June in Hobbs, N.M., consists of three buildings that wrap around an atrium with a children’s play area and elliptical equipment. 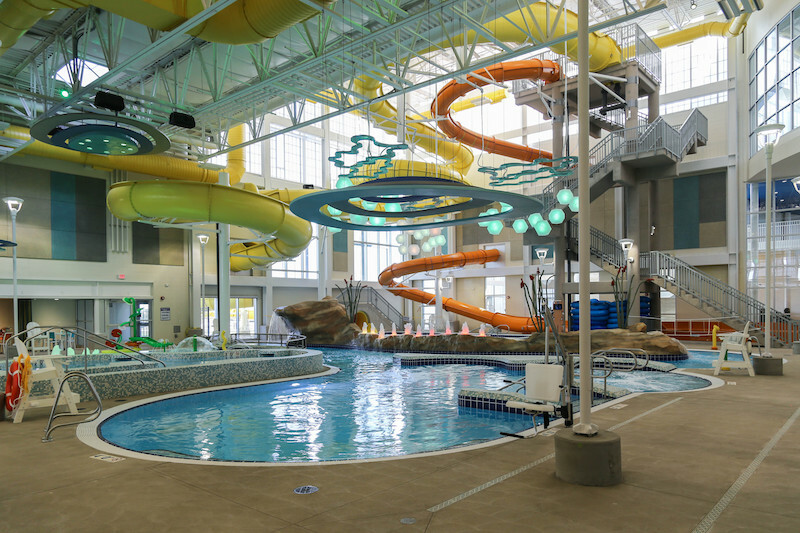 CORE, which includes competitive and leisure pools and slides, is a prime example of how important aquatics is to the drawing power of any rec center. Haydon Building Corp. was the GC on this project, designed by Barker Rinker Seacat Architecture. Image: Barker Rinker Seacat Architecture. Another BRS project is an 87,000-sf, $46.1 million rec center in Lewisville, Texas, which broke ground last July and is being funded by the largest municipal bond package ever passed by that city (in 2015). When it opens in 2020, this facility—called “Thrive”— will include an indoor natatorium, gym, expanded fitness area, community room, indoor kids playground, and an 8,000-sf senior activity center. “Municipalities with fast-growing populations are building ‘lifetime’ fitness centers that are more affordable solutions for their communities than [private] health clubs,” says Tony Battle, President-South Texas for Byrne Construction Services, the GC on the Lewisville project. Byrne also built a 77,000-sf rec center on 11 acres in New Braunfels, Texas. That facility, called Das Rec (there’s a local German heritage), opened on July 21 with a 7,300-sf fitness floor, a 20,000-sf gym with an elevated track, an aquatic center with an eight-lane pool, and an indoor-outdoor water slide. The construction cost was $20 million, according to Stephen Springs, AIA, Senior Principal, Brinkley Sargent Wiginton Architects, the rec center’s designer. Days before Das Rec opened, it had already signed up 4,153 members, says Stacy Laird Dicke, the city’s Parks Director. Rec centers reflect their communities’ current needs. Take, for instance, the Robert Crown Community Center in Evanston, Ill., which broke ground on July 13. When completed, this $53 million facility—which is replacing a decades-old center that drew more than 100,000 visitors annually—will feature a full-size hockey rink and gym for league sports. But it will also include a 5,000-sf library branch, a pottery room, and rentable event spaces. There are some must haves in all rec centers, such as child care, fitness and weight rooms, party rooms, and classrooms. Cities also consider features and functions they hope will generate membership and revenue. “There’s a lot of pressure on municipalities to extract more revenue from these facilities,” says Springs. So rec centers might be less likely to include, say, a climbing wall, which while fun isn’t going to be used by a lot of people. But figuring out what to include in a rec center is complicated by the fact that it can take years, and sometimes decades, for cities to assemble a financing package for these facilities that the community—which is footing at least part of the bill through taxes or bond paybacks—will accept. Dicke says that she had been pursuing a new rec center for New Braunfels since she was hired in 2004. Salt Lake County in Utah identified the need for more rec centers in its 2005 and 2015 master plans. Last June, a 59,817-sf rec center broke ground in Draper, Utah, on land the county had purchased 17 years earlier, according to Holli Adams, AIA, LEED GA, Principal with Arch|Nexus, the architectural firm that’s the designer and sustainability consultant on this project. As part of its needs assessment, the county hired the Arch|Nexus to conduct multiple resident surveys to develop the rec center’s programming. The Draper center is funded by a 2016 ZAP3 (for Zoo, Arts, and Parks) bond that allocated $19.5 million to the rec center’s design and construction. Aside from the bond money, the county was able to tap other funding sources. Angelo Calacino, who is co-managing the Draper project for the county, says the school district kicked in $1.3 million for first rights to use of the facility’s eight-lane lap pool. The city of Draper contributed $1.2 million for the rec center in general, and another $1 million for the 18,000-sf fieldhouse, which is a separate building on the rec center’s east side. 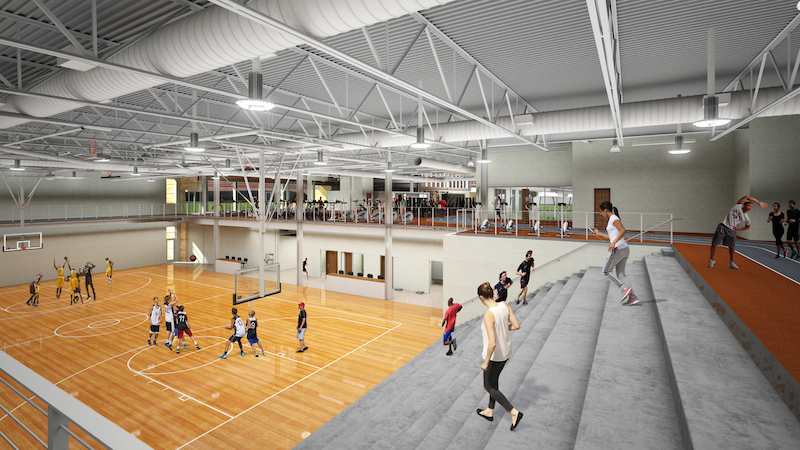 The Draper Rec Center—the 20th in the county’s parks and rec system—is scheduled to open in early 2020. Calacino says an essential design element is the center’s glass façade that takes full advantage of the 20-acre site, which includes an outdoor swimming pool and sports fields, and overlooks Corner Canyon and South Mountain. At the behest of the city and residents, Das Rec, a new recreation center in New Braunfels, Texas, added an eight-lane lap pool and double gym late into the design process. 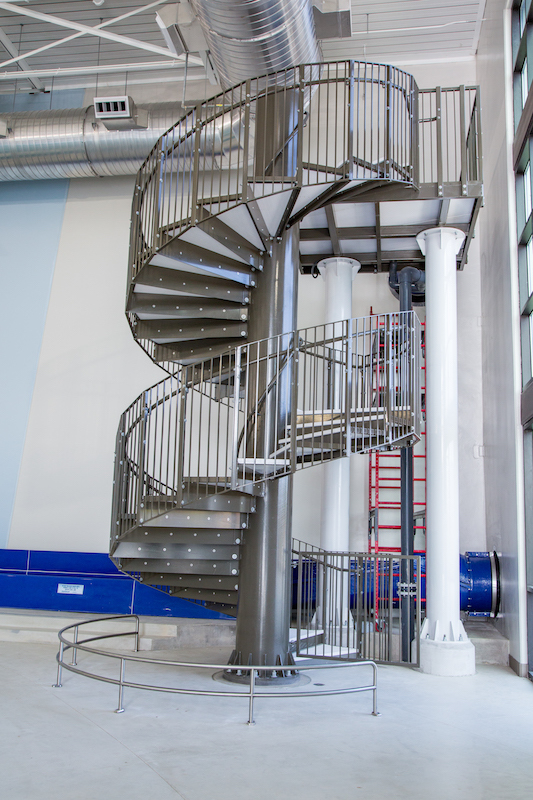 A spiral staircase leads up to a second-floor fitness area. The Building Team on this 74,000-sf facility includes Brinkley Sargent Wiginton Architects (design architect), Byrne Construction Services (CM at Risk), Counsilman-Hunsaker (aquatics engineer), L.A. Fuess Partners (SE), and Cleary Zimmerman Engineers (MEP). Image: Grace Pfeiffer Photography. Over the years, rec centers have become far more multigenerational, with particular attention being paid to providing events and services that appeal to seniors. When the bond issue that’s paying for the Lewisville rec center was passed, the initial plan was to renovate an existing senior center. But the city chose instead to close the old seniors building and include a new 8,000-sf senior activity center within the new rec center, says Stacie Anaya, Lewisville’s Parks and Recreation Director. Catering to seniors “is a big selling point” for rec centers, says BRS’s Bisek. Martin Lehman, President-North Texas for Byrne Construction Services, adds that having a space within rec centers for seniors gives cities more rental opportunities for events like anniversaries. There appears to be some correlation between attracting seniors as members and the greater emphasis that cities are placing on including a full array of water features in new rec centers. When Populous conducted outreach surveys for the city of Aurora, Colo., it heard loud and clear that the community wanted more aquatics in any new rec center. “Water is very friendly to people of all ages, whether it’s for fitness, therapy, improving your mobility, or for socializing. It’s different from a gym or fitness center, which can be a little intimidating to some people,” explains Gudmundur Jonsson, Populous’ Senior Architect and Principal. J. Byron Fanning, the city’s Recreation Director, says that Aurora had been stymied for almost a decade in its efforts to get taxpayers to fund new rec centers. Then, a few years ago, the City Council approved using $2 million in taxes collected from marijuana sales annually over the next 25 years to repay the cost of constructing the two-story, 60,285-sf Central Recreation Center on 20 acres, whose grand opening is scheduled for next year. Populous is the designer and Adolfson & Peterson the GC on this $33.5 million project, which will include a gym and fitness area with a grandstand and large staircase that leads to an elevated track. It also will include a wave pool (the first of its kind in Colorado) and an interactive video water slide. Water Technologies is the aquatics consultant on the Aurora project and the CORE facility in New Mexico that has two aquatics areas: a competition pool with 10 lanes and a 1- and 3-meter diving board; and an indoor leisure pool with a “lazy” river, and two 42-ft water slides that have a sound and light show built into their design. Bisek points out that aquatics can be the most expensive element in any rec center. But aquatics is also the one feature that communities and funding partners seem willing to spend more money on. Springs recalls that when his firm was almost through the design phase for the New Braunfels rec center, “the city tapped the brakes” to reexamine the project’s scope. “There was more excitement about it,” and that’s when a second gym and competition pool were included. Those additions inflated the rec center’s price tag to $23.5 million, but the bond that funded this project only allocated $16 million. So when a contingent of residents who were swimmers campaigned in favor of adding the lap pool, “we started looking for a funding partner,” says Dicke. The city found one in the school district, which came up with $2.2 million in exchange for having its own entrance and being able to use the pool for training and competitions. The city’s Industrial Development Corporation contributed $5.8 million for the double gym. The $32 million Central Recreation Center is the first ground-up recreation center constructed in Aurora, Colo., in nearly 40 years. The natatorium will have multiple leisure pools with a current channel, a slide tower with an interactive video water slide that extends outside the building, lap lanes and a warm water spa. A jogging track meanders around the fitness area that connects to an exterior fitness balcony with views to west, and includes a grandstand for a new take on functional fitness. Layton Construction is the CMCG, Populous the design architect. Image: Courtesy of Populous. In July, the Town Council of Palm Beach, Fla., approved the construction of the 27,800-sf Seaview Park rec center. But that was only after a four-hour discussion about raising the budget for this project to $13.8 million, from $11.1 million, which the project’s GC, Hedrick Brothers Construction, insisted was necessary to cover rising commodities prices. The Salt Lake County Council in July had to approve a $1.6 million adjustment to the budget for the Draper Rec Center to cover increased costs related, in part, to steel tariffs imposed by President Trump. And the Lewisville Rec Center experienced a 1% per month escalation in price during its design phase, which Anaya, its Parks & Rec Director, attributed primarily to labor shortages. Like any building, rec centers are subject to market forces that, recently, have wreaked havoc on budgeting. This might explain why cities are opting for some version of CM at Risk as the preferred delivery method for their rec center projects, say municipal and AEC sources. Calacino says his department hired Layton Construction as GC for the Draper Rec Center before it brought on Arch|Nexus, which was chosen in part because the two firms had worked together before. And Reid praised Haydon Building Corporation, CORE’s GC, as integral to its successful completion early and under budget. This delivery method “allows the city to be more involved from start to finish,” says Lehman of Byrne Construction Services. On the Lewisville project’s preconstruction phase, his firm provided budgeting and constructability reviews that, in one instance, quashed using glulam beams for the pool area as too expensive. The New Braunfels Rec Center was originally designed as a steel structure with load-bearing masonry. But when that was priced out, its cost was too high. So, says Battle, the Building Team reconfigured the building’s design and switched to “sandwich” panels—insulated tilt-up walls—that shaved $2 million. The 26,000-acre Hot Springs Village in Arkansas is the largest gated community in the U.S. Its 14,000 residents have a wealth of recreational options, from the area’s nine golf courses and 12 lakes, to its 30 miles of trails and fitness center. 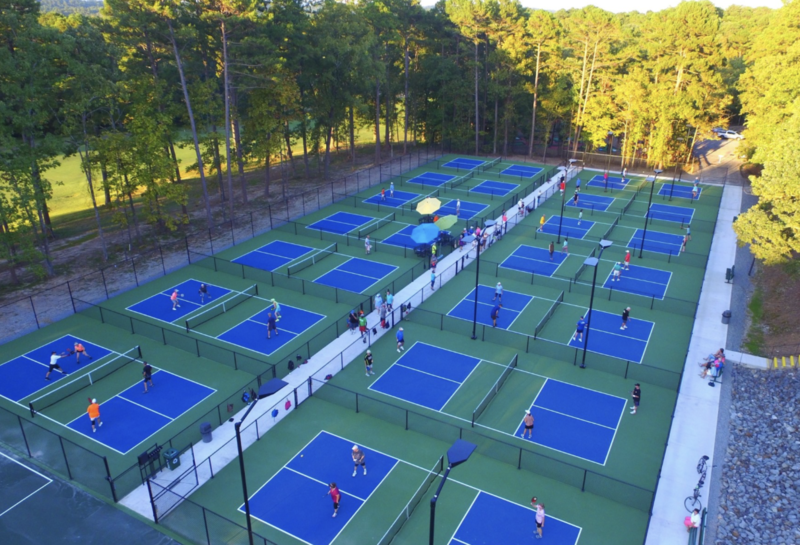 In 2013, the Village converted two hard-surface tennis courts into eight pickleball courts, latching onto a sport that was growing in popularity among the Village’s homeowners. But those courts weren’t regulation size and were obstructed by light poles in the out-of-bounds areas. Over the last four years, cracks in the courts worsened to the point where renovation became unavoidable. This summer, the concrete was poured for the pickleball courts’ 32,130-sf floor. (The concrete contractor was Planit Dirt, the GC Gerald Perry Tennis, and the designer/engineer Crafton Tull.) The courts opened in early September, and their surface is Nova Acrylic’s Ultra Cushion Coating system. Six of the courts are lighted, and future plans call for covering half of them, says Charlie Brown, the Village’s project manager. Each of the courts, located within the DeSoto Family Recreation Park, has its own sponsor, and the Village conducted its first pickleball tournament in the complex on November 10, at which 40 doubles teams from Southern Arkansas competed. A second event, for teams from northern Arkansas, is scheduled for this spring. Prior to starting this $418,000 conversion project, the Village held community roundtables and worked with a subcommittee of the pickleball club, which has 350 members. To complete the project, 26 trees were removed, and a nearby building remodeled. Brown says the Village saved more than $25,000 by having its own Recreation department handle the tree removal.